Gardenia, the number one packaged bread in Singapore, has appeared to have dip its toes into the milk segment. 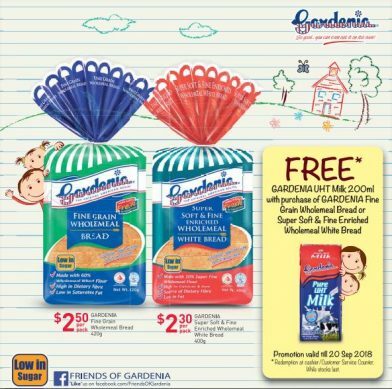 The latest flyer from NTUC FairPrice shows with every purchase of Gardenia Fine Grain Wholemeal Bread Super Soft and Fine Enriched Wholemeal White Bread, you can redeem a free Gardenia Pure UHT Milk at the service counter. This promotion started on 7 September 2018 and will last until 20 September 2018. The UHT milk is a product of Australia. Gardenia has diversified into complementary products such as spread in recent years. Plus, it has bundled its bread with other dairy products or juices for promotion. So the move into dairy is a natural progression for a packaged bread company.